The last time I visited The Hall of Fame was in 1999 and 2000. Back then it was all about the record breaking season of 1998. They called the exhibit, "The Great American Home Run Chase of 1998." 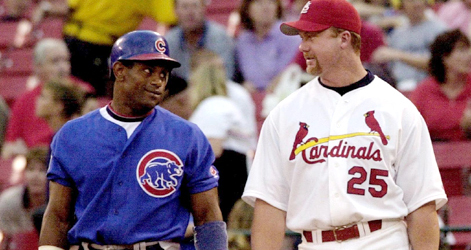 That exhibit involved the Mark McGwire and Sammy Sosa showdown. The chase involved the two National League giants in little uniforms pursuing the all time record for home runs in a single season. The home run record of 61 accomplished by the balding Roger Maris in 1961. The exhibit location was in the center of The Hall of Fame Gallery where all the plaques of the tremendous Hall of Famers reside. The McGwire and Sosa display included baseballs, bats, cleats, and uniforms from their record bashed and juiced enhanced seasons. I remember back then thinking that those two guys would eventually be enshrined there with their own plaques. I even thought out loud which team hat McGwire would wear on his plaque, Oakland or St. Louis? (Frank Robinson wears an Oriole cap on his plaque.) Upon arriving in the gallery for the first time since 2000, ten years later, more changes were going to come. The two muscle enhanced machines were nowhere to be found. McGwire and Sosa were replaced by American League dignitaries sculpted out of wood beautifully, The Great Babe and The Splendid Splinter. The amazing wooden statues were an honor to see on craft and merit alone. It was as if The Hall of Fame was reminding us of greatness instead of honoring two frauds who had rescued attendance during a time Baseball had endured some trouble. Now it seemed like it was out with the old and in with the older. I applauded out loud explaining to Dad the whole scenario rather proudly. Upon continuing our journey through The Hall, I asked Dad who he expected to see more of, "The Hammer or Bonds?" I had an idea and we were soon to find out for the better.